New Brunswick is now the third Canadian province to report the discovery of White-nose Syndrome. It was discovered by a team of researchers from the New Brunswick Museum during a visit to a cave on March 15th. The outbreak has occurred in the most important known bat hibernaculum in the province, home to approximately 6,000 bats. Initial estimates put the mortality rate in the cave at around 25%, much less than some other locations where the mortality rate was almost hit one hundred percent. Current figures put the total of bats killed by the disease at one million. 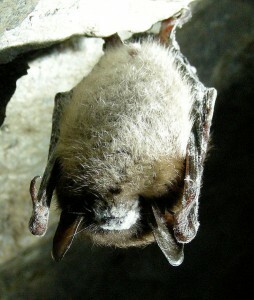 In 2010 cases of White-nose Syndrome were found in the Canadian provinces of Ontario and Quebec. So, the message of this story is — stay out of caves where bats are present, or know to be present in the winter months. Otherwise, you may be spreading the fungus that kills them! The chances of anyone that has been in a whitenose infected area and going into NS caves are pretty ridiculously slim. The bats, are unfortunately primarily doing it to themselves without our help. My mistake, I meant NB.